Stoneyford United lose to Bridge United A.
Bohemians win against Stoneyford United. Deen Celtic despatch Stoneyford United. Stoneyford United are currently on a losing streak of 6 games.They have lost 6 out of 7 away games. Freebooters has yet to be beaten in this competition, having won every game. Stoneyford United suffer defeat to Evergreen FC A.
Stoneyford United are currently on a losing streak of 6 games. Evergreen FC A are currently on a winning streak of 4 games.They have won 4 out of 5 away games. Thomastown United claim victory against Stoneyford United. 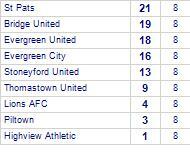 Thomastown United have won 6 out of 7 home games. 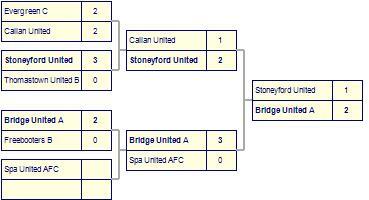 Stoneyford United suffer defeat to Bridge United A.
Bridge United A have won 5 out of 6 away games.